Manchester United manager Sir Alex Ferguson insists the title race is far from over, despite his side's last-gasp victory over Liverpool at Anfield. United, who have nine games left, are now nine points clear of Chelsea. 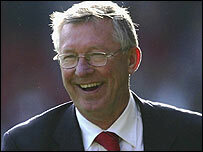 But Ferguson said: "There is a big difference but I don't think anything is impossible in modern-day football. "Liverpool will feel unlucky and they deserve to. We had a lot of narrow escapes and they upset our rhythm. It was a massive victory." With Man Utd nine points clear at the top of the table is the Premiership over? John O'Shea struck the winner against the run of play for 10-man United in injury time and Ferguson said: "If you are looking for the luck of champions, then we have certainly had that in the last two matches. "We broke away late on against Fulham and scored and now we've done it here. We've had that bit of luck in the last two weeks but you need luck if you are to win titles." Liverpool manager Rafael Benitez agreed that the better side had lost, and stated: "I would have trouble explaining how we lost that in Spanish; in English I find it almost impossible. "We dominated the game, were in control and had plenty of attacks. Sometimes football is all about luck. You must be careful against a team as good as United." And the Spaniard tipped United to go on to win the title, saying: "United are really close to the title now. Chelsea are a good team but they cannot make mistakes now because United will continue to win. "As for us, we are down now but we will train hard and be ready for our Champions League tie against Barcelona on Tuesday."